Mike McCormick was a $50,000 bonus baby at 17, a sore-armed castoff at 25, and a Cy Young Award winner at 29. The left-hander went 34-4 at Mark Keppel High School in the Los Angeles suburb of Alhambra and 49-4 in American Legion ball. In his senior year he pitched two no-hitters for the high-school team and three more in Legion play, including a perfect game in which he struck out 26 of 27 batters. Named to an all-star team for the Hearst Newspapers sandlot tournament, he struck out 15 straight over two games. After the final game, at the Polo Grounds in New York, Mrs. Lou Gehrig presented him with the outstanding-player trophy named for her husband. Scouts from 15 of the 16 major-league teams were waving checks, but McCormick planned to go to the University of Southern California with his all-star teammate, Ron Fairly of Long Beach. He changed his mind when he saw the size of the bonus offers: “I realize that fifty thousand dollars will buy me a lot of education and it’s an opportunity I may never get again, so I accepted it.”3 New York Giants scout Dutch Reuther was the winning bidder. McCormick signed on August 31, 1956, still short of his 18th birthday. Four days later he made his professional debut at the Polo Grounds, retiring all three Philadelphia Phillies he faced on six pitches in a perfect eighth inning. Newly married to Carolyn Koehler, whom he had met at the Presbyterian church in his hometown, the teenager had gone from high-school phenom to big leaguer in less than a week. Growing up in California, where there were no big-league teams at the time, he had not followed the majors and had no idea who his teammates were. “I knew Willie, and that was it.”4 The older Giants treated him well, but he had little in common with them. He spent hours walking the streets of New York alone. With the Giants stumbling to a sixth-place finish, manager Bill Rigney gave his bonus boy a start on September 5 at Philadelphia. McCormick threw his first two pitches in the dirt and walked three in the first inning, then two more in the second. He was relieved after allowing two runs. In his second start, ten days later at home against St. Louis, he walked four and gave up five runs in four-plus innings against St. Louis. He took the loss in his first decision. 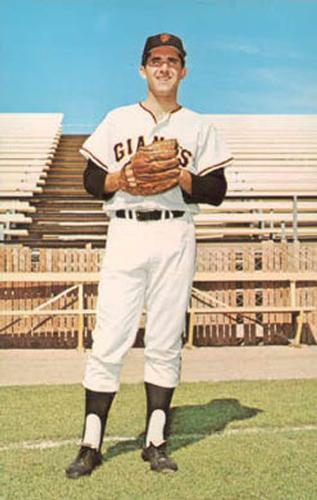 Baseball rules required a bonus player to stay on the big-league roster for two years, so McCormick spent most of 1957 in the Giants bullpen. He pitched 24 times, primarily in relief, compiling a 3-1 record and a 4.10 ERA. His first victory came on July 25, when he held the Cubs to two runs and six hits over 8 ? innings. Marv Grissom relieved to get the last two outs; at 39, Grissom was older than McCormick’s father. The youngster roomed with the team’s left-handed pitching ace, Johnny Antonelli, who could understand what he was going through; Antonelli had been a bonus baby with the Braves, ignored by his manager and teammates. The two could have passed for brothers, both about the same size at 6-feet-2 and 190 pounds, with dark hair and crew cuts. The Giants moved to San Francisco in 1958 and introduced six rookies, including Orlando Cepeda and Felipe Alou. The 19-year-old McCormick emerged as the club’s third starter, chalking up an 11-8 record despite a 4.59 ERA. The next year, San Francisco held onto first place for most of July, August, and September. In the climactic September series against Los Angeles, the Dodgers won the first two games and stood just one game behind when McCormick started the finale. Protecting a 1-0 lead, he allowed only three hits through the first six innings. Instead, the Dodgers went on to win the game while the Giants lost five straight and the pennant. McCormick, pitching 225 ? innings and relieving between starts, dropped five of his last six decisions to finish 12-16, 3.99. One of his victories was a rain-shortened, five-inning no-hitter against the Phillies. He carried another no-hitter into the eighth against the Phils. McCormick came into his own in 1960, leading the league with a 2.70 ERA and striking out more than twice as many as he walked. In the best game of his career, on April 20, he walked the Dodgers’ leadoff batter in the first, and then retired the next 13 in a row. He finished with a two-hitter for a 1-0 victory over Don Drysdale. Pitching in his first All-Star Game, he allowed only an unearned run in 2 ? innings. The Giants farm director, the Hall of Fame left-hander Carl Hubbell, praised McCormick’s “pitching instinct.”6 His record was only 15-12; the Giants scored no more than two runs in eight of his losses. The next year McCormick’s 3.20 ERA was the NL’s fourth best, although he gave up the most home runs in the league and his record fell to 13-16. With McCormick and the budding star Juan Marichal, the Giants appeared to have the core of a young, strong pitching staff. But McCormick had piled up almost 1,000 innings before his 23rd birthday; only Bob Feller had pitched more in the longball era since 1920. The workload caught up with him in 1962, when he suffered shoulder soreness that never went away. While the Giants won the pennant in a playoff with the Dodgers, McCormick contributed little: a 5-5 record and 5.38 ERA. His fastball seemed to have vanished. X-rays showed no damage and the club told him he was fine. “Well, I wasn’t fine,” he said later. “I couldn’t throw the ball 60 feet without getting tears in my eyes.” At times his shoulder hurt so badly that he “hoped the catcher wouldn’t throw the ball back.”7 Manager Alvin Dark thought McCormick was malingering. He watched the World Series from the bench and was traded to the Baltimore Orioles in December. He was just 24, but several sportswriters wrote the epitaph to his career. Serving as a spot starter for Baltimore in 1963, McCormick completed only two of 21 starts with a 4.30 ERA. Publicly, he insisted his shoulder was fine, but that was not true. Doctors at Johns Hopkins hospital diagnosed a torn muscle. (Nobody then used the term rotator cuff.) The next spring he hit bottom when the Orioles sent him down to Triple-A Rochester. After seven full major-league seasons, it was McCormick’s first taste of the minors. And a lucky break: A Rochester doctor gave him a cortisone shot, easing his pain, and he bounced back to win eight of his last nine decisions with a 3.29 ERA for the Red Wings. The Orioles, still skeptical, shipped McCormick to the Washington Senators for a minor-league pitcher and cash. In two seasons with the expansion Senators, McCormick reinvented himself. His fastball never returned, so he relied on control, changing speeds and his screwball. “I re-established credibility in myself and got my feet back on the ground to where people recognized that ‘He’s not the same type pitcher that he used to be, but he can pitch,’ ” he said.8 Although he had a losing record with the losing team, McCormick’s ERAs were slightly better than average. “I was left-handed and I had good control, so I was allowed to stay around.”9 After the 1966 season Washington traded McCormick back to San Francisco. He still lived in the Bay Area, in Mountain View, so he was happy with the deal. McCormick picked up his 100th victory during his Cy Young season. He was still only 29. But the next year his screwball stopped breaking. He was hit hard (comparatively speaking; 1968 was the year of the pitcher) and was consigned to the bullpen in August. He finished 12-14, 3.58. “I was the victim of bad pitching,” McCormick said. “My own.”13 He bounced back to an 11-9, 3.34 mark in 1969, but that was the end of his effectiveness. In 1970 a pinched nerve in his back caused numbness in one leg. He was torched to the tune of a 6.20 ERA and was traded to the Yankees in August. New York released McCormick in the spring of 1971, but he quickly hooked on with the Kansas City Royals. While trying to make the team, he bent over and felt a pop in his back. His fingers soon went numb. Released by Kansas City, he underwent surgery and won an invitation to spring training with the Giants in 1972. When the team cut him, he announced his retirement. But the lure of a comeback was too strong. McCormick joined the Giants’ Triple-A club in Phoenix, where another former pitching star, Jim Maloney, was also trying to resuscitate his career. Both retired in June. “I’ve had my day,” McCormick said, “and it was a lot of fun.”14 Again he flunked retirement; within a month he signed with Triple-A Hawaii and finished the season 7-5. He went back to the islands in 1973 and made the Pacific Coast League all-star team, but the club released him a few weeks later, apparently to shed his high salary. He finished the season with Tacoma of the PCL, then retired for good at 34. McCormick had prepared for life after baseball by working as a stockbroker in the offseason. He later sold office equipment in the Bay Area while doing promotional work for the Giants. He had four children from his first marriage, and settled in Sunnyvale, California, with his second wife, Deirdre. 1 New York World-Telegram and Sun, September 1, 1956, in McCormick’s Hall of Fame file. 2 San Francisco Chronicle, March 17, 1958, HOF file. 3 Mike Mandel, SF Giants: An Oral History (self-published, 1979), 92. 6 Jack McDonald, “Pitching Instinct Helps Mike – Hubbell,” The Sporting News, June 8, 1960, 3. 7 Mandel, SF Giants, 94; Doug Brown, “McCormick’s Wing Brakes Oriole Plunge,” The Sporting News, June 29, 1963, 10. 8 Mandel, SF Giants, 94. 9 San Francisco Chronicle, March 24, 2002, HOF file. 11 Chicago Tribune, September 21, 1967, HOF file. 12 San Francisco Chronicle, June 30, 1967, HOF file. 13 Harry Jupiter, “Starter-Reliever Menu Just Right for McCormick,” The Sporting News, September 28, 1968, 10. 14 “Phoenix – End of the Line for McCormick, Maloney,” The Sporting News, July 1, 1972, 33. 15 San Francisco Chronicle, March 24, 2002, HOF file.